What is Tree Topping and Why is it Not Allowed in Portland? | Mr. Tree, Inc.
Old growth trees are assets worth saving. Yet, they can quickly become a concern with heavy branches overhanging structures, growing into power lines, or otherwise presenting hazards. When this happens, you might consider tree topping as opposed to complete removal of the tree. In the Pacific Northwest, we all know the feeling one gets when we see a residential property graced by healthy, well-manicured trees that have been growing there for decades. It’s a sense of permanence and stability, that feeling of a place. The mature trees on your property enhance the beauty and add to the value of your real estate. They provide privacy, and also offer cooling shade for your yard and home. From an environmental standpoint, established trees prevent soil erosion, purify the air, and support a biodiverse plant and animal culture. It’s understandable that the mere thought of sacrificing your beautiful, old growth trees can be distressing, but overgrown trees pose several problems, too. Branches can take out overhead wires during storms, resulting in power outages. They can cause surface damage from scraping against siding and roofing. Larger limbs, unable to withstand the weight of ice and snow in winter storms, can come crashing down. With the potential for significant and costly damage to your property, structures, vehicles, and more, you may have considered tree topping as an alternative to complete tree removal. However, the practice of topping trees, once considered a solution to the challenge of overgrowth, is highly discouraged and, in many instances, not even permitted in the Portland area. Tree topping is a destructive practice of removing overgrown branches that pose potential hazards or inconvenience by cutting them back to short stubs. Whether done to one section or side of the tree, or over the entire canopy, it often defeats the purpose of trying to keep a valued tree that has overgrown its boundaries. Tree topping stresses the entire tree system all the way down to the roots. The initial stress of removing limbs and branches triggers the first weakening of the tree’s immune system making the natural recovery process difficult. The wounds, or open surfaces where cuts were made, are susceptible to insect infestation and disease, further threatening the tree. In fact, the tree may even begin to produce chemical signals that actually attract insects and parasites. Contrary to popular myth, sealing the wounds with paint or other similar application won’t help. The damaging results are compounded by the substantially reduced leaf canopy. Leaves produce needed carbohydrates for the tree. They also shade the bark. A sudden loss of leaves during summer months can cause sunscald, damaging and even destroying a tree’s previously healthy bark and underlying tissue. With all of its self-supporting systems weakened, the tree can no longer sustain healthy growth. Extensive tree topping can sometimes even lead to the immediate death of a tree, more often with certain species of trees. If the tree does survive the initial assault, it usually responds with a rapid growth spurt. Don’t be fooled into thinking you’ve saved the tree. These new branches are weaker and poorly attached making them more prone to breakage from wind, ice, and snow. Despite its appearance, the tree may still spiral into descent and eventual death. Is There a Way to Keep My Tree Other Than Topping? A regular schedule of proper pruning and maintenance will keep your trees from overgrowing their boundaries in the first place, and prevent them from coming into contact with overhead wires, buildings, and other structures—or hanging threateningly over neighboring property. But what if you’ve simply let too much time go by without proper maintenance, or have recently purchased a property with a troublesome tree or two? You may still be able to save them with professional trimming. Selective, strategic pruning starts with the removal of smaller branches. They should be cut all the way back to their point of connection to a larger limb or the tree trunk, just outside of the branch collar and bark ridge. Larger branches and limbs can be removed back to lateral growth of relatively equal size. This preserves the natural form and balance of the tree canopy and is less likely to result in irreparable damage due to stress. When branches are pruned correctly in this way there is far less chance of internal decay. The correct cut also promotes more rapid closure of the wound and the bark will grow more quickly over the injury. Careful pruning in this way causes less overall shock to the tree. By scheduling regular pruning over a course of time you can often eliminate the overgrowth that is causing problems and then continues to keep it contained in the future. This approach allows you a better chance of keeping your old growth trees. When all is said and done, a topped tree is less attractive, less healthy tree that will require extra care and maintenance, and is likely to spiral into decline and premature death—all due to the very effort of trying to avoid its removal. Unfortunately, the best solution is sometimes to remove the tree completely and replace it with a new one. The professionals at Mr. Tree can help you make the right decision. And, if removal is recommended, can help you select a species that meets your needs and is more appropriate for your landscape. Be sure to check with your municipality for guidelines or regulations regarding all of your major landscaping projects. In the Portland area, you may need a permit for large trimming jobs or tree removal. 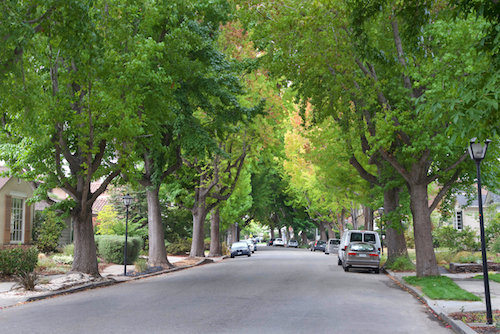 Topping publicly-owned trees, including trees in the right-of-way between the sidewalk and the curb, can lead to fines and/or mandatory removal and replanting of the topped tree.